Transactional messages continue to generate much higher customer engagement than broadcast email. Transactional emails performed markedly better than nontransactionals, particularly those sent by the top quartile of companies. These generated a 72 percent open rate and a 30 percent click rate. The statistics underscore their importance as part of an effective email program. Companies representing Computer Hardware and Telecommunications, Corporate Services, Insurance, Hospitals/ Health Care and Consumer Products performed consistently better than others this year. Content marketing is likely one of the factors that helped propel the Computer Hardware and Corporate Services verticals to the top. These B2B companies typically send value-added email newsletters that give subscribers reasons to open, click and retain for further reading with content such as industry news, best practices, case studies and tips. Although each one might not have "led the league" on each metric each time, across all measurements they were regularly among the top three. Emails in these categories generally are more likely to be personalized to the subscribers or to contain highly relevant information, which leads to higher opens and clicks as well as more opens per opener and clicks per clicker. 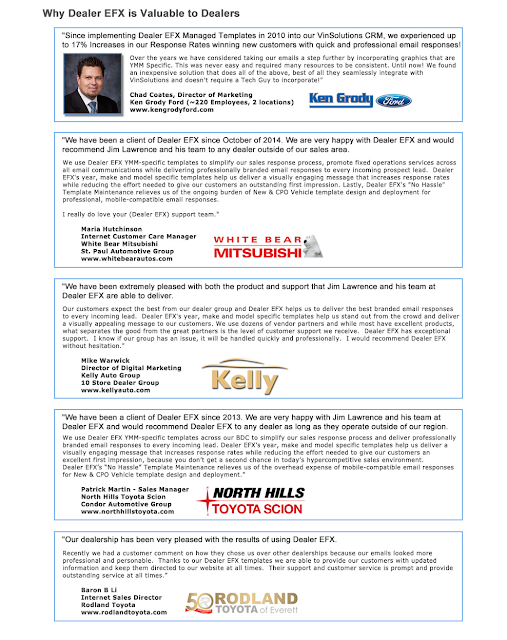 These are some of the most relevant emails car dealers, ad associations and OEM's can send because they speak to actions your customers have taken and represent another avenue to broaden engagement with the dealer or car company. One factor that distinguishes Silverpop's annual benchmark survey is that it goes beyond simply reporting statistics to look at how the auto industry compares to other verticals on email marketing performances. The full report notes the verticals which outperformed others most frequently on most metrics.